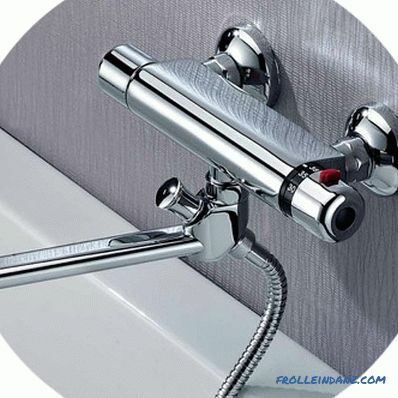 To learn how to choose a bathroom faucet with a shower, it is not enough just to come to the store and listen to the advice of the seller. Only by carefully studying the design features of the device, the principle of operation of its mechanisms, their advantages and disadvantages can a good choice be made. 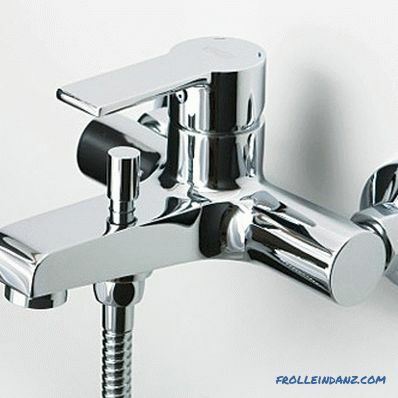 All faucets for a bath can be divided into two large groups - these are tap-box and single-lever faucets. These devices differ among themselves as controls, and the mechanisms providing mixing of water. Tap-box mixers are the most popular and easy to manufacture, and therefore cheaper. They got their name by the name of the main structural element, by means of which the supply and regulation of water flow occurs. 1. Worm - with rubber locking cuff. The cuff is attached to the rod, when turning the valve the worm gear pushes the rod, closing the hole from which water flows. 9. Screw for fastening the locking gasket. + Pros: The main advantage of this type of crane box is its low price of the product and reliability of the metal mechanism. In addition to repair such a mixer is very simple. It all comes down to replacing the closure cuff made of thick rubber or silicone. - Cons: Of the drawbacks, it should be noted not too much ease of use. 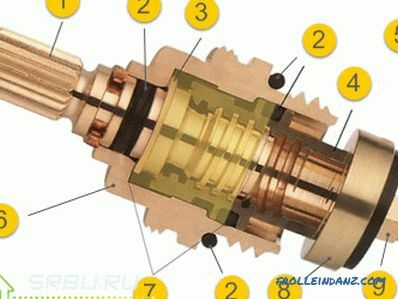 To obtain the required temperature and intensity of water flow, you need to turn the valve 3-4 times. All this time, the water will be poured out for nothing, so that the economy of the crane is rather doubtful. The locking cuff periodically begins to leak, but if the replacement is made by hand, then this is not such a big problem. 2. Ceramic - they have two plates with oblong holes, one of them is fixed in the housing, and the other is attached to the stem. By turning the valve and moving the movable plate, it is possible to align the holes and allow access to the flow of water. 8. Ceramic crane box assembly. + Pros: The advantages of a ceramic crane box are, first of all, ease of use . The stem is rotated only 180º (half-turn) or 90º (quarter). The mechanism is reliable and durable, does not emit extraneous noise and does not require the application of excessive effort when opening. - Cons: Disadvantages - this is the high cost of the product. Sensitivity to water with solid impurities, which lead to rapid wear of ceramic plates. The crane-axle box itself is almost impossible to repair, it has to be completely changed. IMPORTANT! To prevent a quick failure of the ceramic crane cases, a coarse filter is slammed into the water supply pipe. CONCLUSIONS . If financial opportunities permit, it is advisable to purchase a ceramic faucet, but if tap water is dirty and minor repairs to plumbing do not pose a problem, then it is much cheaper to purchase a faucet on worm faucets. To independently determine the type of crane-box mixer, it is enough to turn the handwheels. In the ceramic, the handles turn only half a turn; in the worm gear, the rotation continues. Achieving the required temperature and the required amount of water jet head in these mixers is done using a cartridge. In the people such mixers are called one-handed - all processes are controlled by one handle. Despite the appearance different from the previous mixer, the principle of cartridge operation is similar to the operation of a ceramic crane box. Mixing and water pressure are carried out by the same ceramic plates rotating relative to each other, with all the attendant advantages and disadvantages. It has the same principle of operation and principal design as the ceramic crane box. Consists of two ceramic plates with holes.The lower stationary (A) through which comes hot and cold water and there is a drain hole and the upper movable (B). The temperature of the water and its pressure depend on the area where the holes on the two plates coincide. 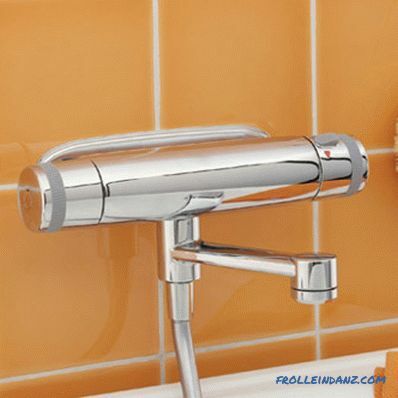 Thermostatic mixers appeared quite recently, but have already found their consumers. 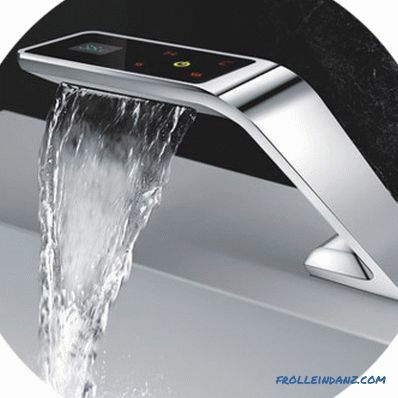 The device consists of a panel with buttons for turning off and on the water, a regulator for switching the temperature and water pressure, a hole or a tap to exit the jet. Thanks to the integrated software device that maintains the intensity of the jet pressure, the water temperature, the thermo-mixer is the safest of all the previously listed devices. Electronic - equipped with a liquid crystal screen. The operation of such devices requires the connection of a network adapter or conventional batteries. Mechanical - regulating the process with handles and valves. Additional power supplies are not required. The principle of operation of such a device is as follows. The flow of water into the mixing chamber regulates the valve that reacts not to temperature, but to the intensity of the flow. If the pressure of one stream becomes greater or less, the throughput of the second gateway will change accordingly. 1. With eccentric switching mechanism shower-outflow . Due to the rotation of the handle, through the eccentric, there is a movement of a double-sided rod with rubber gaskets at the edges. Depending on the required mode, one of the openings is closed - to the shower or to the spout. The mechanism is quite reliable and cheap. 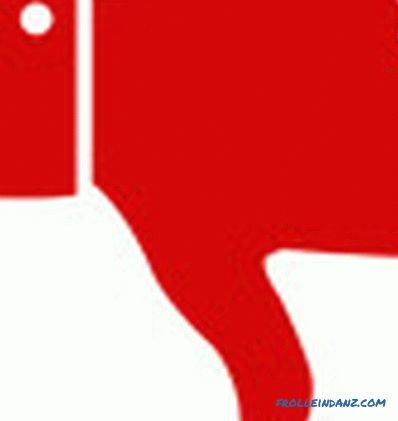 Its repair, and even more complete replacement is not difficult. It is mounted on any type of crane, the main thing is to match the diameters of the spout and mechanism. Rubber gaskets wear out quickly. Considerable overall dimensions of the product, if the mixer is to be mounted high above the bath. 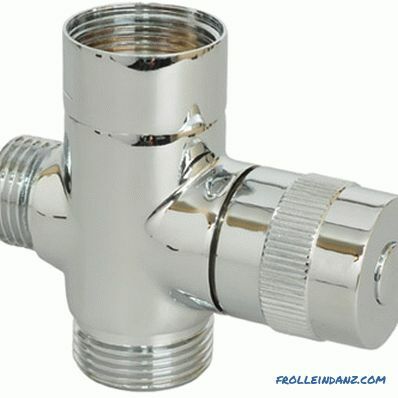 With frequent bends of the spout, the connections are loosened and they must be constantly tightened so that they do not leak. 2. With a cartridge mechanism for switching the shower-spout . The mechanism is represented by one device - a cartridge. 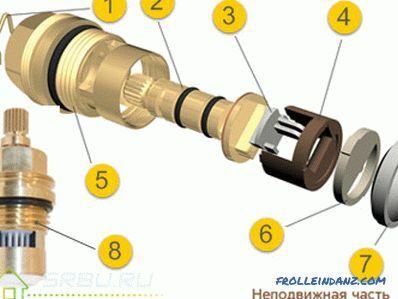 The mechanism is the most reliable and durable, it is easy and quick to replace . It has an attractive design, simple convenient operation, small dimensions. The cartridge itself cannot be repaired, after failure, a complete replacement is necessary. Compatibility problems may occur with some “universal” cartridges from repair kits. It is recommended to purchase parts only from the same manufacturer as the mixer. 3. With ball diverter for switching shower-outflow . The main assembly is a ball with holes located between two annular gaskets. Water, falling into one of the side holes of the ball, goes into the spout or shower through the other. Considered the most reliable and durable to date. The deviator mechanism is integrated into the body of the mixer and is non-separable. 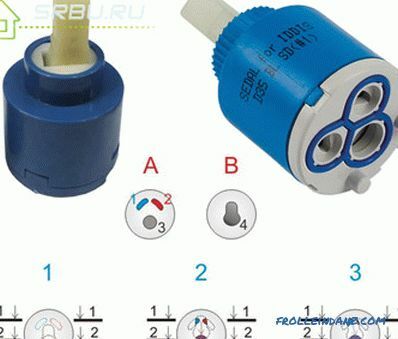 If the switch fails, its repair is impossible, it is necessary to change the entire mixer. 4. With cork deviator for switching shower-outflow . The principle of operation of the device is similar to eccentric. But the locking mechanism is actuated not by a turning handle, but by raising or lowering a kind of cap. Externally, the device looks very compact and stylish. The dimensions of the mixer do not increase. 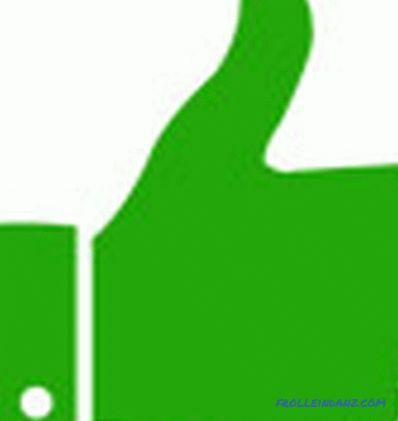 Switching is quite easy, provided that the design provides embossed protrusions. Complicated to repair, it is very difficult to get the necessary parts. 1. Mixers with built-in mechanisms . The advantages of the built-in mechanisms lie in the compactness of the mixer itself, the reliability of operation and the absence of leaks. In addition, most models with built-in mechanism are controlled by one movement: by pressing a button or by turning a lever. The main disadvantage You can consider the complexity of the repair, the only exception is the cartridge mixer, where you just need to replace the entire mechanism.In some models, after the failure of the deviator, the entire mixer must be replaced. 2. Mixers with external mechanisms . External mechanisms are mounted between the mixer and the spout, having an additional outlet for the shower hose. 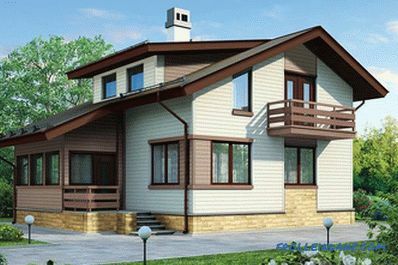 Their main advantage is ease of installation, maintenance and replacement. 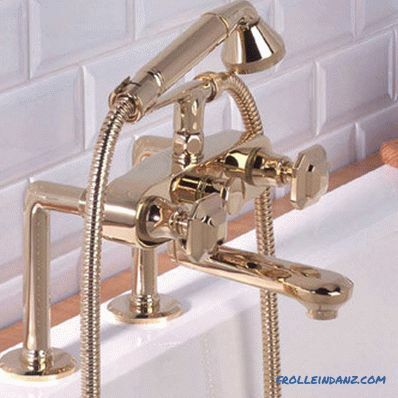 They are pretty inconvenient to use, faucets with them have a not very aesthetic appearance, for their installation the faucet must be located at a considerable height above the bath. 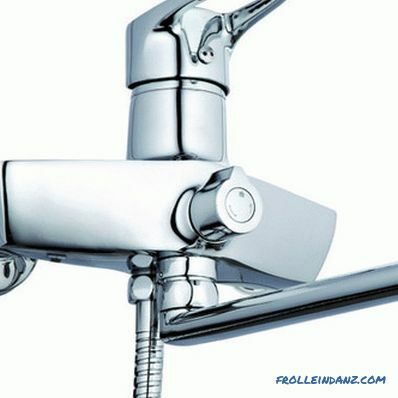 If the faucet is located between the bathroom and the sink, and the spout is constantly moving, the use of an external deviator is quite doubtful, as it quickly begins to weaken the joints and leak from frequent movements. 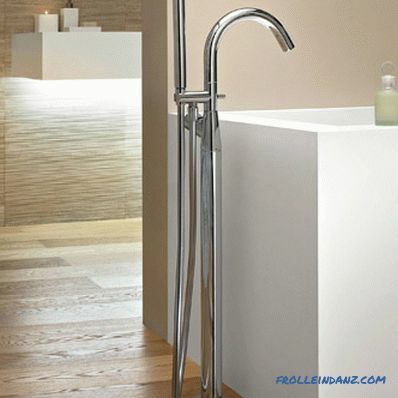 The most popular model of bathroom faucets is with a long spout. In the case when the bathroom and the sink are close to each other, the installation of an additional tap over the sink is not required. 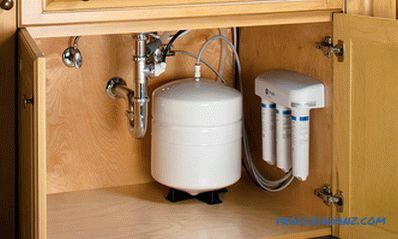 Swivel spout saves money during installation of devices, but requires additional investments during operation. Frequent rotational manipulations weaken the connection between the spout and the mixer. When buying a mixer with a swivel spout, pay attention to the angle of movement of the device and the length of the crane. The best option more than 30 cm with a wide range of action. Short spouts appeared in the bathrooms later than long ones, but managed to occupy their niche. The main advantage of such models is a small area of ​​the required space and the ability to install directly on the edge of the bath. In small rooms, a short spout for the mixer would be most welcome. The choice of the length of the faucet depends on the placement of the washbasin and the bathroom, on the area of ​​the room itself, on the planned installation location of the mixer. 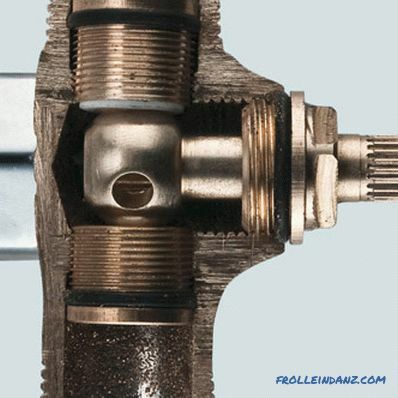 When choosing the right model, pay attention to the spout nozzle. The design of the nozzle is of two types: an aerator or a shower-watering can. The first option saves some water consumption. In the aerator, the so-called "cavitation effect" occurs: mixing water flow with air. When the tap is not fully open, the output is a good water pressure. The second is used in two modes: a shower or a jet. The flow of water is divided into many streams, eliminating the effect of splashing. The second option is more convenient, the first is more economical. 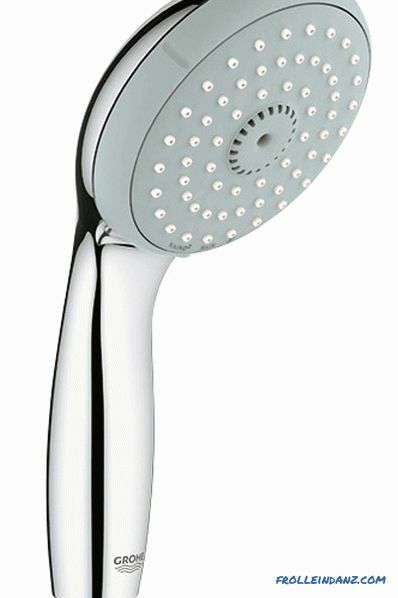 The choice of shower heads is huge. Asking how to choose a faucet in the bathroom, familiarize yourself with the types and functional features of the shower head. Various functions, design, irrigation area, material - how to make the right choice? The most popular materials are plastic or metal. The metal watering can is stronger, more durable and more expensive. Plastic - cheaper, but with a shorter service life, breaks easily. 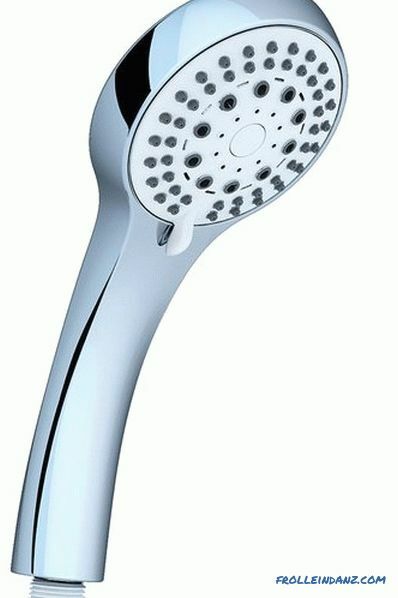 A modern shower head is simply obliged to have several modes of supplying and spraying water. Jets can be intense, drip, massaging - pay attention to the number and variety of modes. 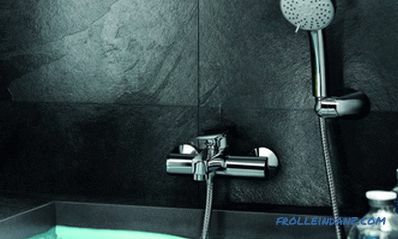 Installation type of shower head: wall, ceiling or manual. Choose manual - take care of the holder. 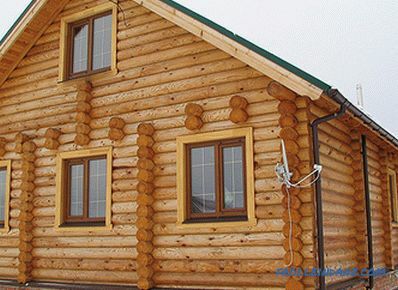 The classic and most commonly used method of installation design. Recommended height - 20-30 cm relative to the edge of the bathroom. When choosing the length of the spout, make sure that the water jet does not fall on the edge, but into the bath itself. Used when the bath is located away from the wall. The complexity of installation is justified by an interesting bathroom interior. The mounting method is gaining popularity. It is used for baths of complex construction with already prepared holes for the installation of the mixer. If desired, the holes can be made by yourself. A rare and expensive installation method used in design projects. Stainless steel is the most practical and most popular option. 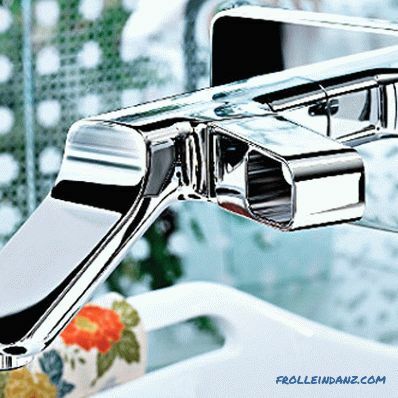 The steel faucet is reliable, durable, inexpensive, looks good in any interior. Brass or bronze have a longer service life, look stylish, but also cost more. Silumin is a cheap but unreliable material. The service life of the mixer of any configuration 1-2 years. If you need a high-quality mixer that works well and without failures - stop choosing brass or steel. Enamel, chrome, stainless steel are used for the external coating of the mixers, various coatings are used. Enamelled coatings give the product a matte or granular texture. On the enamel surface there are no traces of touching the fingers and water droplets. Chrome-plated coatings increase the strength and hygiene of the mixer. They are beautiful and easy to care for. 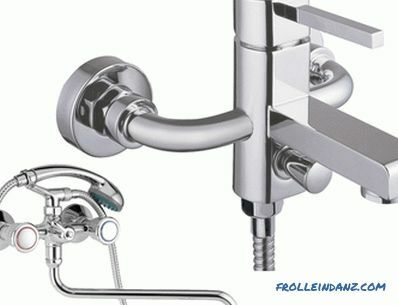 The question of how to choose the right faucet for the bathroom, so as not to regret buying, has been almost resolved. 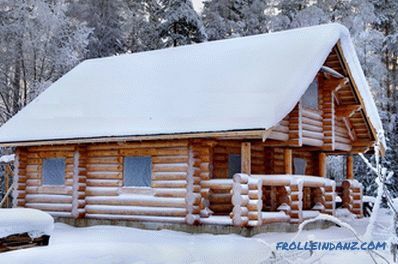 But there is another criterion that it is desirable to take into account when acquiring plumbing. 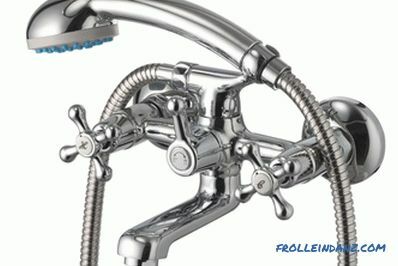 Want to get famous German quality and relatively cheap prices - pay attention to Grohe mixers. The company entered the market in the late 90s of the twentieth century and continues to maintain a strong position among manufacturers and exporters of mixers. Careful control over each manufacturing stage. Strict compliance with the percentage of materials for the production of cranes. Analysis of the quality of the flow of every hundredth sanitary device. 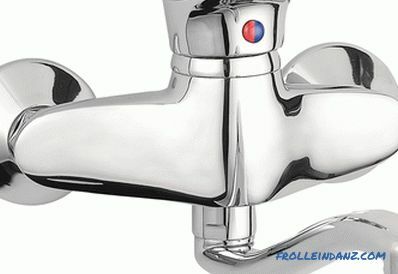 The Danish manufacturer of stylish bathroom faucets combined quality and recognizable unique style in their devices. For more than 80 years of existence, many buyers have managed to evaluate the brand - almost 50 thousand mixers come to the store shelves every day. Use of the latest innovative technologies in production. Significant reduction in water consumption. Stylish design and full compliance with requirements. Mixers made at Finnish enterprises are the perfect combination of design models, electronics, modern materials and alloys. Passing mandatory bench tests eliminates the possibility of leakage or breakage of sanitary products. Automatic compensation of the difference in pressure and temperature in the water supply system. Reliability, durability, ease of use. Economical use of water resources. After analyzing the data provided, it is possible to draw certain conclusions about which faucet to choose for a bathroom with a shower. For middle-class consumers, the single-lever mixer is the most optimal in terms of quality performance and price category. The switching mechanism shower-spout - cartridge built. Devices with a crane-box principle of operation, using an eccentric as a switch, are not only morally obsolete, but also have a short service life. There is a future for thermostatic mechanisms. As soon as the price of programmable mixers drops, their sales will rise sharply.